With Verizon announcing the first 5G telecom commercial trials for this year, communication service providers globally are scrambling to be ready for mass deployment in 2020. The revolution is going to require a new way of thinking about networks, as 5G will bring with it significant changes to the OSS landscape. 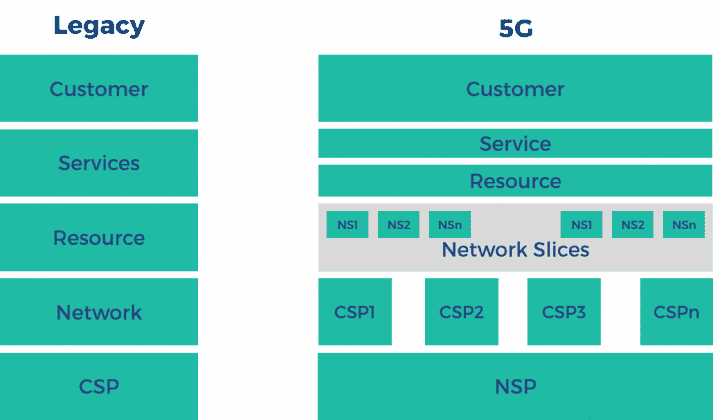 In setting out a 5G architecture explanation, it is necessary to consider 5G network slicing. The new technology will add management layers to networks, leading to greater network complexity in which NSPs and CSPs will both operate. Effectively, this means the possibility of many virtual CSPs – each with several network slices for different 5G services such as uRLLC, eMBB and mIOT – operating over one NSP. With new management layers will come the requirement for data models that can handle them. The fact of 5G network slicing will demand adequate functionalities for everything from planning and fulfillment to on-boarding, creating, instantiating configuring and activating or deactivating these slices and pairing functions. This is because of the potential differentiation of 5G telecom services – such as uRLLC for autonomous vehicle services, eMBB for video streaming, and VR, AR and mIoT for applications that enable connected factories. Of course, 5g network slicing means more data, and the associated challenge of assurance for the various 5G services and information that accumulates from them. Each slice might require a different assurance approach – for example by giving priority to latency and reliability in KPIs for the uRLLC network slice, while focusing on bandwidth for eMBB. The state of digital transformation in telecommunications already means that great importance is placed upon scalability. The kind of automation that can take place now – triggering up/down/in/out scaling operations based on KPIs from different resources will not, in theory change. What will be different is that 5G telecom advances will require this automation to be tailored for each network slice. Commerce is at the heart of technological progress, and with 5G will come the emergence of new business models and opportunities for B2B and B2B2C companies to exploit new revenue sources. Diversification of services into new fields and the massive rise in data generated as a result means that every business or vertical will need a CEM that is flexible enough to address their specific business models. Find out how prepared telecoms companies are for the digital era! As Head of OSS Product Management, Michał is responsible for the creation, development, promotion and sales of Comarch OSS products. He majored in Telecommunication Networks and Services at the Technical University in Krakow. His previously roles have included that of Network Optimization Specialist at T-Mobile, as well as Analyst and Head of OSS Consulting at Comarch.